We finished with our shopping, let's checkout our shopping cart. Oh wait! Jack, your trolley is empty, you didn't buy anything at all? We ordered the usual 6 piece chicken wing but where's the famous Swedish meatballs?! How could you dine in at IKEA without ordering the signature dish? Well we could, why not! The grilled salmon is lovely too and it's on special offer the day we went, so yeah ^_^ See ya another day meatballs! After dinner, Jack wanted to grab some food for himself because he did not get to eat any of the above! Jack Husky :"Yes, hotdog with chilli sauce and mustard!" Which is only for One Dollar! 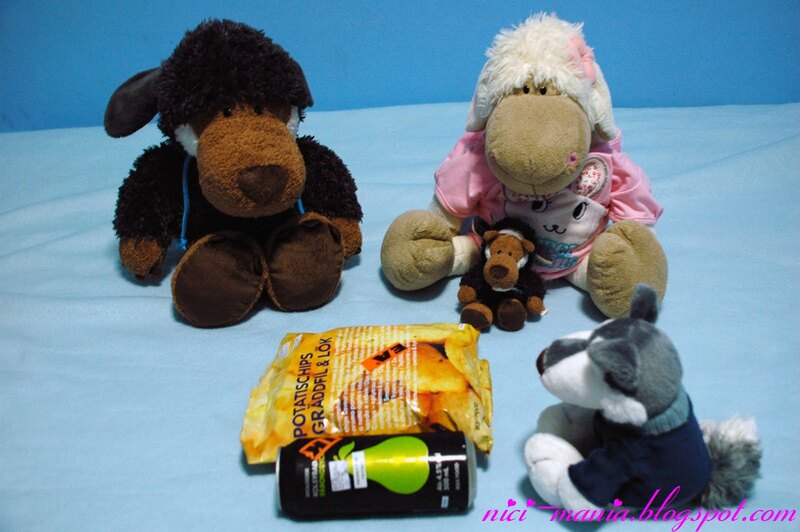 But Jack, you squeezed too much chilli sauce..
Our Jack Husky brought home some Swedish goodies! 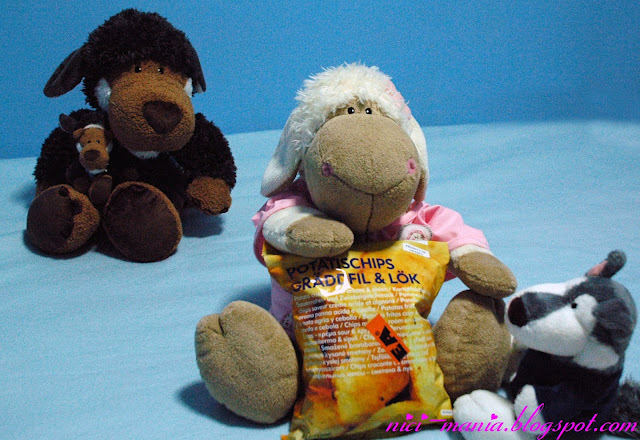 Knowing that Jolly Rosa loves potato chips, he bought home a packet of Swedish chips for Rosa to try! Hugo Wolf :"Did you buy anything for me?" Jack Husky :"Of course! I know you love alcoholic drinks, so we got you a can of sparkling pear drink, 4.5% alcohol! hehe"
Let's share these shall we? This is the sparkling pear drink. It actually taste like a desert wine with gas. You don't really feel the alcohol because it is quite sweet. But the alcohol effect will kick in after drinking a whole pint. IKEA is only selling one flavor of the chips, which is sour & cream. The texture of the chips is the same as our favorite Kettle Chips. The taste is not really special but Jolly Rosa is still eating her heart out of it! Rosa! We caught you red handed!! Did Rosa like the chips? They look tasty!! Rosa! We hope Rosa at least shared her chips with her friends! Thanks for recommending the Daim sweet and Daim cake :) By the way, they have alcoholic apple drink too but we thought pear sounded tastier. We wanna go back to IKEA to get a few more pints of pear drink, hopefully they are still there! IKEA loves to change their food and drinks selection periodically. Rosa likes chips indeed... Her wish is to try potato chips from all over the world! Thanks Ute! Jack enjoyed the one dollar IKEA hotdog. Cheese potato chips is our favorite also!